This sink from Kraus adds a nice touch of elegance to any bathroom. You'll be impressed at how well its stylish ceramic design holds up against everyday wear and tear. You'll be glad you chose this top-grade sink for your next home renovation project. This elegant sink from Kraus combines top-notch style and efficiency to elevate the look of any bathroom. Manufactured using high quality ceramic, it can withstand all kinds of everyday wear without losing its stylish appearance. Clean up in style with this top-of-the-line sink, perfect for a wide variety of bathroom designs. From the expert craftsmen at Kraus, this vessel sink combines timeless style and modern efficiency into an elegant unit. It's been designed with ultra-durable ceramic, capable of keeping its beautiful appearance even after years of wear and tear. When it comes to improving the overall look and utility of your bathroom, this sink is a top-grade choice. This elegant sink from Kraus combines top-notch style and efficiency to elevate the look of any bathroom. It is manufactured with ultra-durable ceramic, so you can enjoy its stylish appearance even after years of wear and tear. Perfect for all kinds of bathroom styles, this sink is fantastic choice for your next home improvement project. The perfect combination of style and lasting durability, this sink from Kraus is just the upgrade your bathroom needs. It's been designed with ultra-durable ceramic, capable of keeping its beautiful appearance even after years of wear and tear. When it comes to improving the overall look and utility of your bathroom, this sink is a top-grade choice. 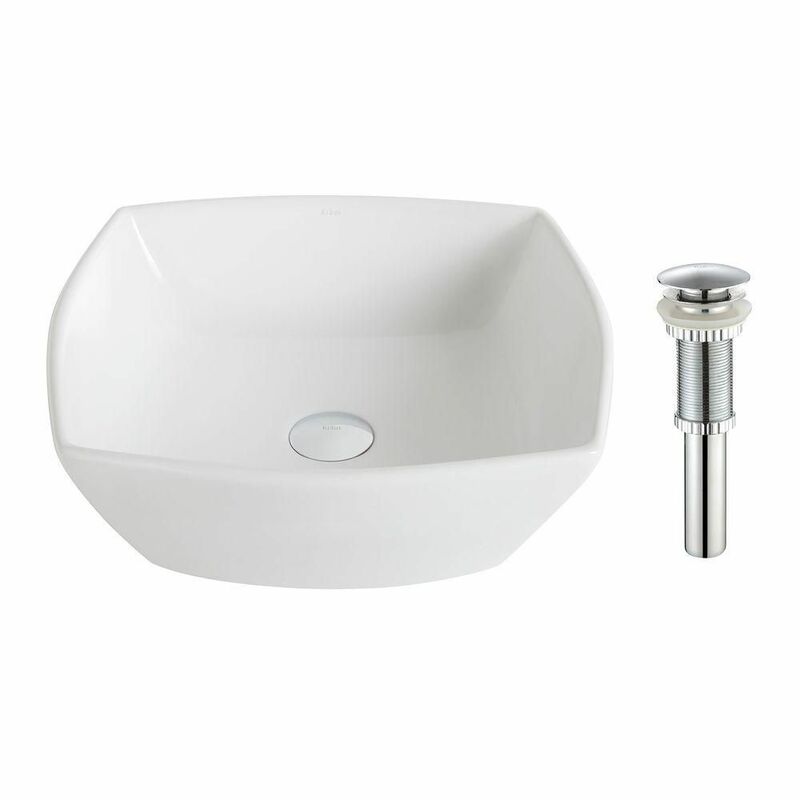 ElavoWhite 16.50-inch x 6.60-inch x 16.50-inch Square Ceramic Bathroom Sink with Drain in Chrome This sink from Kraus adds a nice touch of elegance to any bathroom. You'll be impressed at how well its stylish ceramic design holds up against everyday wear and tear. You'll be glad you chose this top-grade sink for your next home renovation project. ElavoWhite 16.50-inch x 6.60-inch x 16.50-inch Square Ceramic Bathroom Sink with Drain in Chrome is rated 4.7 out of 5 by 9. Rated 5 out of 5 by Reno2019 from This sink is gorgeous and it was easy to install! Love it! This sink is gorgeous and it was easy to install! Love it! Rated 5 out of 5 by Pamc2424 from This vessel sink is beautiful. I have already gotten a lot of compliments on it and it has only ... This vessel sink is beautiful. I have already gotten a lot of compliments on it and it has only been installed a week. Rated 5 out of 5 by dbbb from looks great Replaced existing sinks. Looks great. Works well. Installed easily.